It’s been a long time since I last spent Christmas with my brother. Plus having his sweet girlfriend there too was an added bonus. 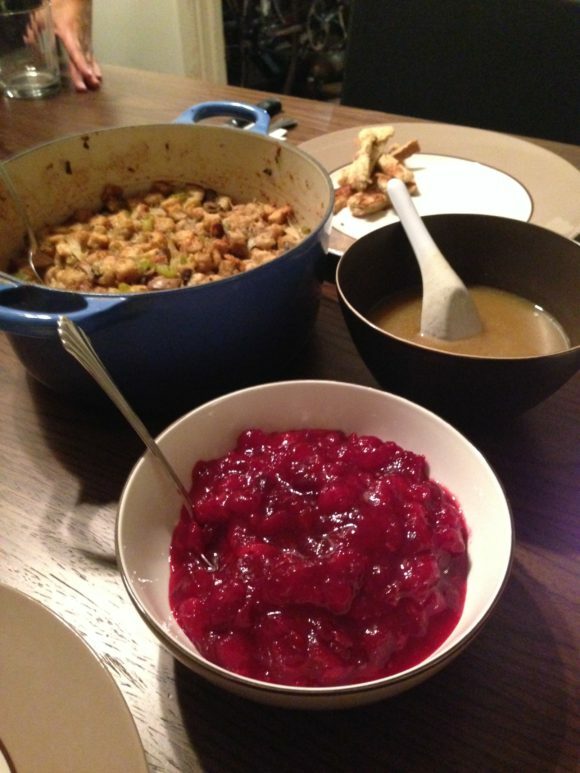 My brother is an excellent cook, and one of his favorite things to make is a turkey dinner with all the fixings. I was really excited. For sides he was planning brussel sprouts, mashed potatoes, and stuffing. The one thing he forgot to get were the cranberries for his homemade cranberry sauce. So on the way home, despite my protests, we stopped at the grocery store, where he ran in and got some cranberries. He said the lines were crazy but a cashier, probably seeing that he had one thing, took pity on him and rang him up at customer service. Dinner was excellent. My brother’s girlfriend made garlic mashed potatoes, and those were really good too. 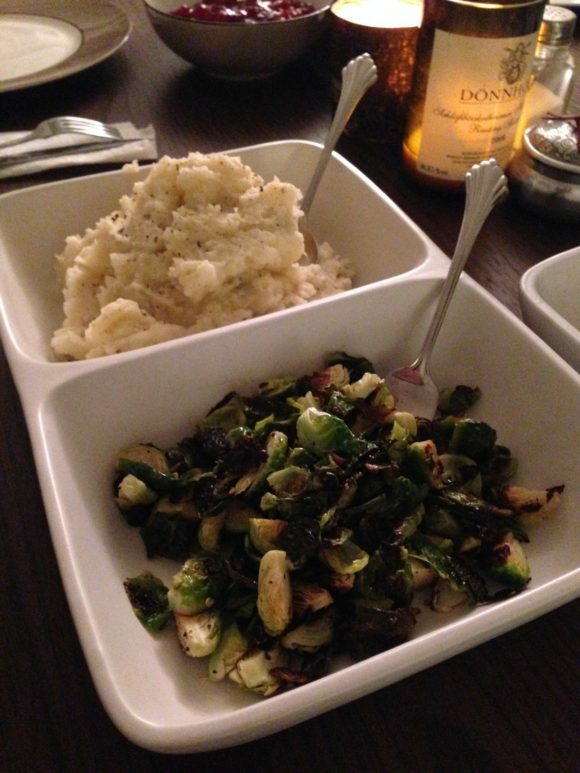 Garlic mashed potatoes and brussel sprouts. After cleaning up we took a walk around the neighborhood. It wasn’t too cold out, and it was really nice to see all the lights. On one of their walks, they had found a house with an amazing tree house, and that was sort of our goal. At first it seemed we wouldn’t find it, but then we did. The tree house was crazy and wonderful. Like something out of Swiss Family Robinson. After a morning of opening presents and an afternoon of eating leftovers and lazing around, we headed out to my brother’s friends’ place for a little Christmas party. The hostess is a an anglophile and so as per British tradition, handed out paper crowns and little gadgets and toys, including Christmas crackers. Dinner was great. Ham with potatoes, zucchini, sweet potatoes, stuffing, and delectable dinner rolls with this incredible cinnamon butter. After dinner was the gift exchange. There was some specific exchanging as well as kind of gifts that were just free-for-all, like a grab bag. The hostess was kind enough to give me Cinder by Marissa Meyer, a young adult book that’s a science fiction take on Cinderella. In a nutshell: Cinderella is part cyborg. Exactly up my alley. After that we played this fun “gambling” game called Left, Right, Center. I won’t get into the details except to say that in the end my brother’s girlfriend won. The game involves lots of single dollar bills and she hilariously threw the money up like confetti after she won. All in all, one of the most fun Christmases I’ve had in a long time. Catch up on my other Christmas-in-Los-Angeles posts. This entry was posted on Tuesday, December 30th, 2014 at 9:33 am	and is filed under food, holidays, los angeles. You can follow any comments to this entry through the RSS 2.0 feed. Both comments and pings are currently closed.